Sascha171 1. September 2018 17. November 2018 Keine Kommentare zu Why Germans are the key for world peace. Most people are not aware of it, but the state of war declared on July 31, 1914 in accordance with Article 68 of the Reich Constitution has never been lifted so what is known as First World War hasn’t ended legitimately at no time. With the coup of November 9, 1918 the legitimate authority of the state was abolished, with the handover of office of the Reich Chancellor Max von Baden to Friedrich Ebert, forced by revolutionary troops on November 12, 1918, a violent breach of the constitution was brought about, the statehood thus came to a standstill. A ceasefire was subsequently concluded, the Treaty of Versailles in 1919, which bears the heading „Treaty of Peace“ instead of „Peace Treaty“, was not signed by the constitutional representative of the German Reich under international law, it was also signed under protest of the non-legitimate German representatives. From a legal point of view the so-called Second World War was only the termination of the 1918 ceasefire. According to the constitution, only the German Emperor is entitled to represent the Reich under international law – he declared the state of war, only he can end it again. On October 28, 1918, US President Wilson responded to the offers of peace repeatedly made to the allied Entente by the German Reich leadership throughout the war by announcing that the Allies would make no peace with the constitutional government of the Reich. This hidden call for a coup is an intervention contrary to international law, the effects of which we still feel today. The course of the following developments is well known: On November 9, 1918, Reich Chancellor Max von Baden announces the abdication of the Emperor without the Emperor actually having had one. 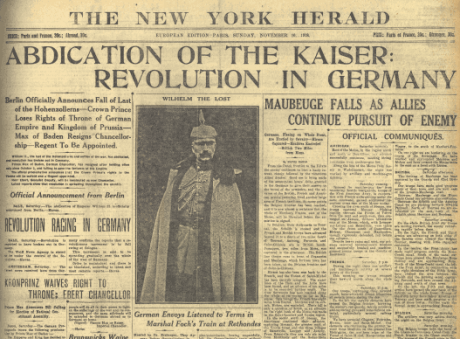 Today we would call that fake news: The – most probably faked – abdication of the King of Prussia and thus of the German Emperor is said to have actually taken place on 28 November 1918, but if you take a closer look you will see that the legitimacy under constitutional law was not preserved here either: On the one hand, the abdication of the King of Prussia must take place unconditionally, i.e. by his own decision and will, and on the other hand, a Prussian government act, i.e. the contrasting signature of a minister, is necessary for the government act to become valid. The abdiction shows only one signature: Wilhelm’s. (see: Wilhelm Bazille – Our Imperial Constitution, §24 II. Termination of the Government and §22 VI. The Ministerial Countersignature – Contrast Signature). The emperor, at that time in the headquarters of Spa, far away from the imperial capital, was forced under these circumstances to go into exile, where he would remain until his death. A coup is never legal: Right can’t grow out of injustice. In those days, almost exactly 100 years ago, the subject of international law, the German Empire, has become incapable of acting in the absence of its representative under international law. Since then, the German Reich, which has been kept in the state of war, has become the pledge of geopolitical interests of supranational powers. Anyone who knows that the League of Nations was created within the framework of the Treaty of Versailles and that this very League of Nations transferred control of Palestine to England with the Palestine Mandate in 1922 knows the connections. It is the little known part of history – because it is the decisive part of history. A peace treaty, the name suggests it, creates peace – in this case for the German Reich. Only the German Emperor has the legitimacy to sign a peace treaty for the Reich; according to the Constitution of the Reich, he is the representative of all Germans under international law. But since 1918 there has been no emperor left. The title emperor, which is the presidency of the German constitutional union called Reich, belongs to the king of Prussia. The king of Prussia is determined by agnatic linear order with primogeniture order (right of descent and first birth) in the house of the Hohenzollern. However, the Hohenzollern have abdicated – whether lawful or not, remains to be seen. (The legal fact that Prussia today still exists as a kingdom and why the founding of the Free State of Prussia in 1920 was unconstitutional and illegitimate is explained in detail at https://preussenjournal.net/2018/10/23/immernoch-koenigreich-kein-freistaat/). In the event that no king exists or is capable of government, the Constitution of the Kingdom of Prussia provides in Articles 56-58 for the person of the regent. For the present situation one can assume these basic conditions: Although there is an Agnat of full age, he is permanently prevented from governing by being a prisoner of war. Art. 56 If the king is a minor or otherwise permanently prevented from governing himself, the Agnat of full age (Art. 53) who is closest to the crown takes over the regency. He must immediately appoint the chambers which decide in a united session on the necessity of the regency. Art. 57 If there is no Agnat of full age and no previous legal care has been taken in this case, the Ministry of State shall appoint the Chambers, which shall elect a Regent in a united session. The Ministry of State shall lead the Government until the beginning of the Regency on its part. Art. 58 The regent shall exercise the power vested in the king in his name. The same shall, after the establishment of the Regency, swear an oath before the United Chambers to keep the Constitution of the Kingdom firm and unbreakable and to govern it in accordance with it and the laws. Until this oath has been taken, the entire existing Ministry of State shall in any case remain responsible for all acts of government. The German nationals of the Kingdom of Prussia hold the key to world peace in their hands with articles 56-58 of their constitution! All Prussian nationals are therefore urgently called upon to register with the Prussian Institute of Bismarcks Erben and to participate actively in the legal reorganization of the Kingdom. Through the municipal organization on the basis of state self-administration, the state structures can be created which make possible the election of a regent and imperial administrator and thus of a representative under international law for all Germans. The Prussians have it in their hands! They just have to do it! All other German nationals are urgently called upon to inform about the actual legal situation in the German-speaking but especially also international area! The world has been burning for 104 years. The fire must be put out now! Only Germans can do it.